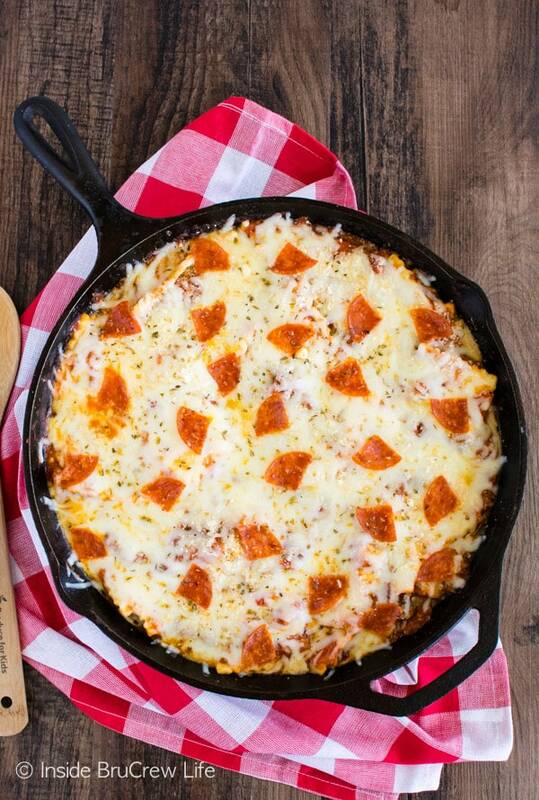 This easy Meat Lover’s Pizza Skillet Ravioli is loaded with meat and cheese and can be on your dinner table in under 30 minutes. 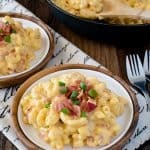 Awesome meal for busy school nights! Now that school is back in session, that means I need to get back to planning meals. This summer we slacked off big time on planning dinners for our family. I’m not really sure what we ate every week. Since we are all still alive, we must have had some sort of food each day. Meal planning is one area that I struggle in big time. I can rattle off ten different desserts to create, but when it comes to dinner time I stare at my cupboards blankly! This year the school start and finish time changed, so our kids don’t walk in the door until 4:30 pm. They are ready to devour our entire pantry of snacks the minute they walk in the door. So, I need to be prepared to serve dinner right away before someone has to leave for work or practice. So far I am two for two on making meals. Of course, I served leftovers the second day, so that probably doesn’t really count. But…I’m giving myself a point for it anyway. Desserts like these Oreo marshmallow brownies are my favorite to create, but when I have to make dinner all I can think about is cheesy goodness. 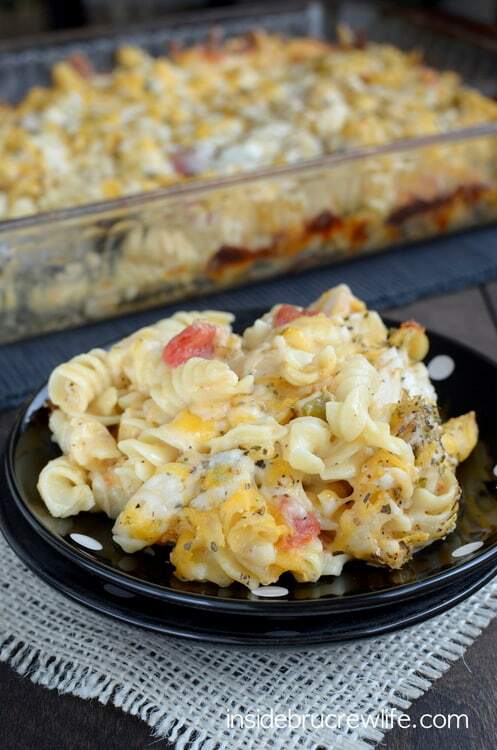 This buffalo chicken pasta bake is always a favorite! 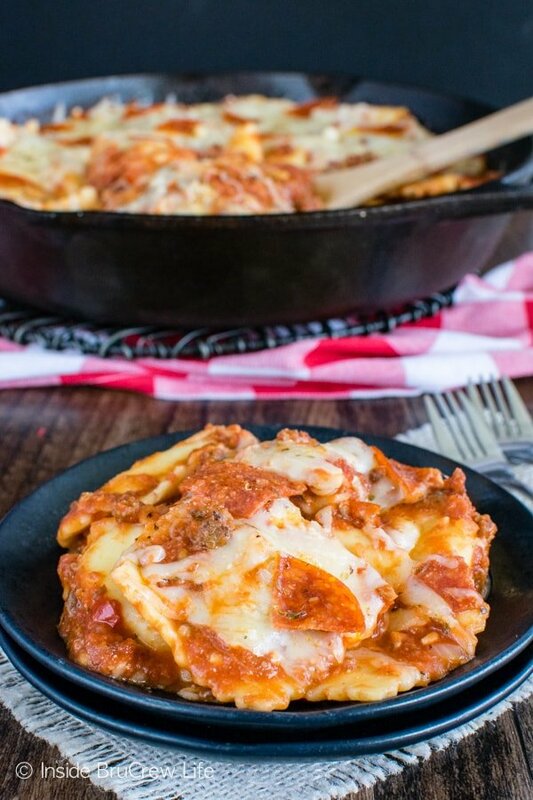 My kids loved this easy skillet lasagna ravioli, so I knew that I wanted to give it a pizza twist using some of the things we had in the cupboards and freezer. Adding onion, garlic, and oregano to a can of crushed tomatoes makes a delicious sauce for the base of this meat lover’s pizza skillet ravioli. A little bit of milk also thins it out and adds flavor. 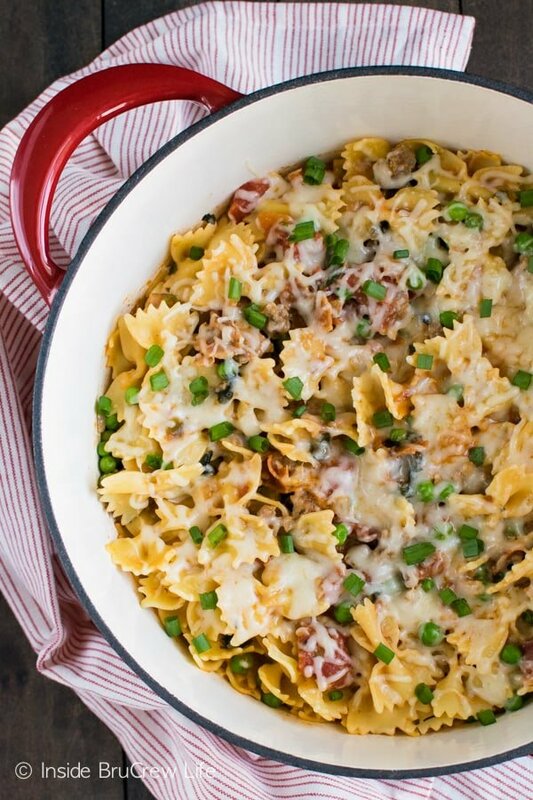 You could also use a jar of pasta sauce if you want to go even easier! Then just simmer the meats that your family loves in the tomato sauce. We had pepperoni, sausage, and bacon leftover from previous meals, so meat lover’s it is! 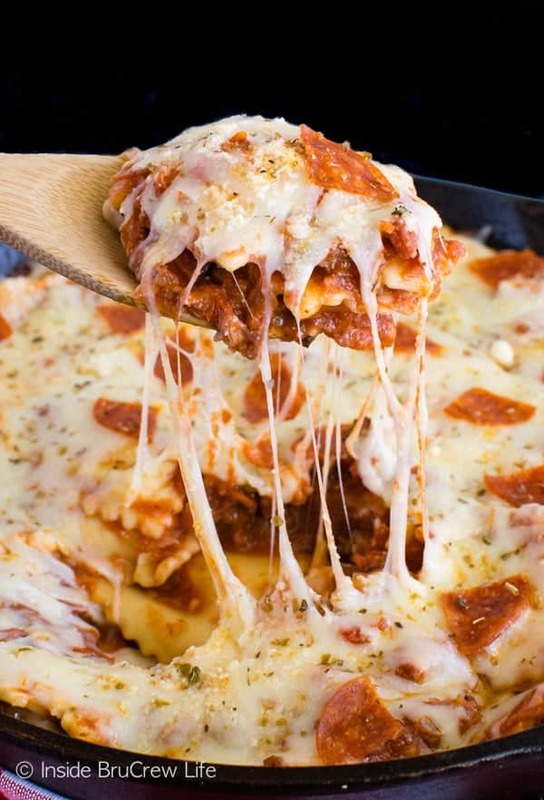 While the sauce cooks in a large skillet, the ravioli can be cooking in another pan. 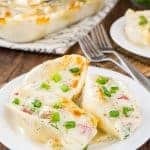 I love keeping bags of frozen ravioli in the freezer for quick and easy meals in a hurry. 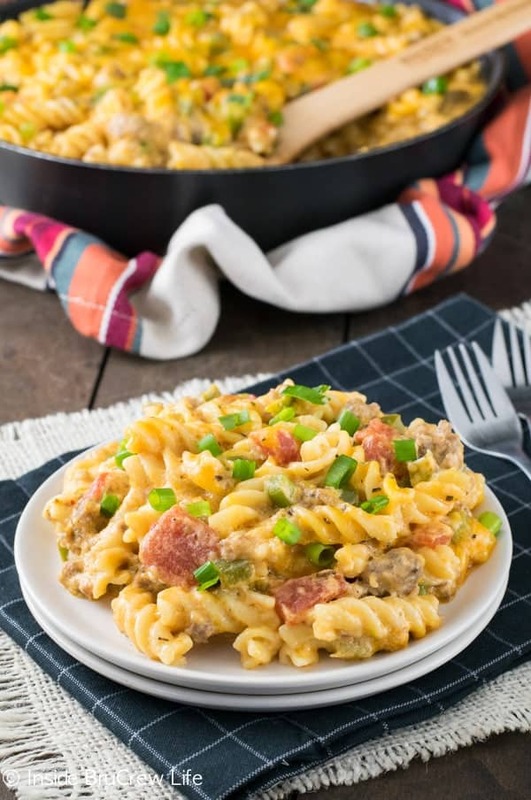 Gooey melted cheese, pasta, and plenty of meat made this easy skillet dinner disappear in a hurry. As long as I keep coming up with dinners like this, meal planning this year should be a cinch! 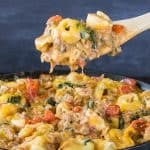 This easy Meat Lover's Pizza Skillet Ravioli is loaded with meat and cheese and can be on the dinner table in under 30 minutes. 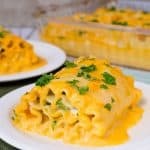 Great meal idea for busy nights. Bring a pot of water to boil. Cook the ravioli according to the package directions. In a large skillet, saute the onions in the oil. Add the tomatoes, garlic, and oregano and cook for 1-2 minutes. Stir in the milk, sausage, bacon, and pepperoni. Save a few pieces of pepperoni for on top. Simmer for 10 minutes. Add the cooked ravioli and stir until coated. Top with the shredded cheese and reserved pepperoni pieces. Cover and let sit until cheese is melted. Sprinkle with parmesan cheese and oregano. Serve immediately. Serves 6. *This post does contain an affiliate link. We do receive a small percentage of sales made from purchases through these links. Thank you for letting us share products we use and love. This turned out gorgeous! 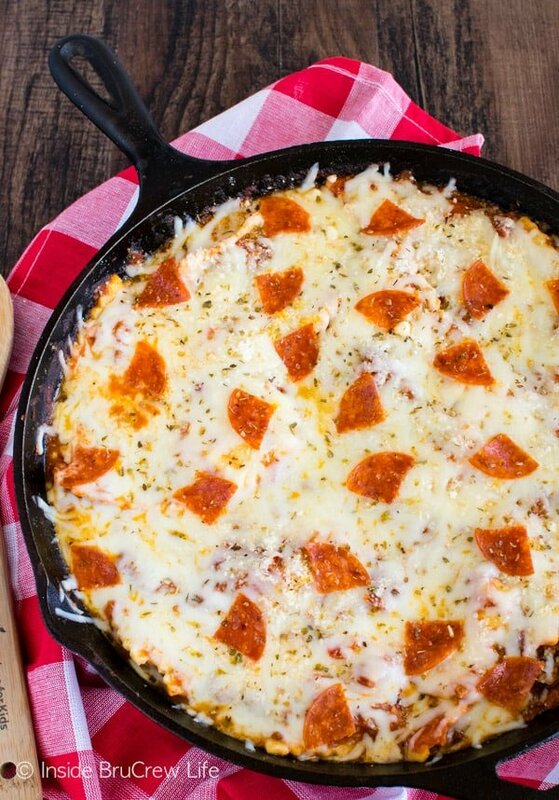 I’m betting the whole family would ask for seconds when I make this. I made this the other night. 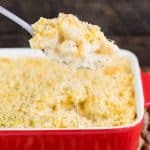 I was five star rating worthy and holds a place on our go-to family favorite recipe list! Thank you!! Woo hoo! That’s awesome to hear your family loved it so much! Thank you for sharing with me!